Bar staff and shop workers are to be protected from violence at work under a proposal to shield those involved in the sale of age-restricted products such as tobacco and alcohol. Labour MSP Daniel Johnson has announced he will bring forward a Member’s Bill this month which aims to make those who attack or abuse workers in those sectors guilty of an aggravated offence. The Bill proposes to deliver a similar type of protection to that afforded to emergency workers. Those who attack police officers or paramedics find themselves charged with a more severe offence. Mr Johnson made his announcement at the Scottish Grocers’ Federation (SGF). Physical and verbal abuse of those working in licensed premises and shops. Figures from the SGF show that refusal of sale and challenging for ID are consistently among the main triggers for incidents of abuse in-store. This is a growing issue in the UK as the Retail Crime Survey, released in February 2017, reported that there had been a 40 per cent increase since last year of incidences of violence and abuse against retail staff. Mr Johnson said: “Violence and abuse has become far too commonplace for staff in shops, bars and pubs across Scotland. It is unacceptable for us to regard such abuse as ‘just part of the job’. That’s why I am delighted to announce that I am bringing forward legislation to protect workers across Scotland. “We rely on these workers to ensure that age-restricted products are kept out of the hands of children, and the legislation requires that they challenge those under 25, and are held liable if they don’t. Those challenges and refusal of sale can act as a trigger point for abuse or violence on workers. 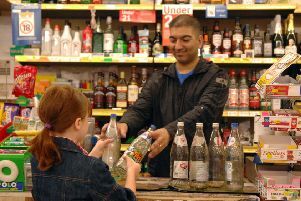 Pete Cheema, chief executive of the SGF, said: “Physical and verbal abuse are every day realities for many stores. Increasingly retailers are being asked to implement legislation within their stores, particularly around age verification. It’s when they try to do this that they suffer from physical and verbal abuse. Scottish Retail Consortium Head of Police , Ewan MacDonald-Russell said: “Violence against and abuse of retail workers is never acceptable. It’s a crime against both those workers and the community they work in, and it’s right we explore all avenues which can reduce the severity and frequency of these crimes.